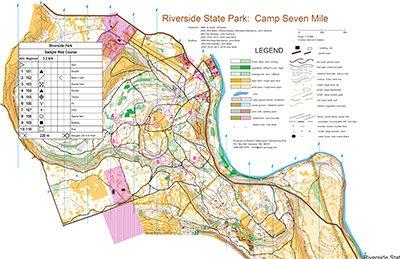 This Riverside State Park orienteering map was produced and is owned by our friends at Eastern Washington Orienteering Club. Feeling a bit scuffed up from thick Western Washington forests? Take a trip to the east side to frolic through “white” open forest, and “yellow” open land. Camping and a gorgeous river are nearby, making it a real summer treat. Riverside offers open forest and open land, providing good visibility. Combined with a network of trails, there is great freedom of movement at Riverside. There are some subtle contours here, but many contour features are dramatic. Some areas are dense with point features. Riverside State Park is made up of many flat plateaus, bordered by steep hills. 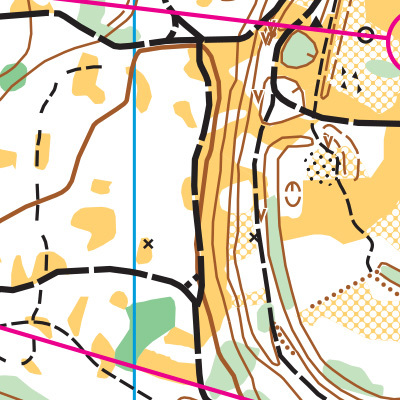 How many steep hills you encounter depends on the course design, the course difficulty level, and the route you choose. Turn left onto S Walnut, which takes you across the Maple Street bridge and turns into N Maple St. Turn left/west onto W Northwest Blvd. Turn right onto N Cochran St. The street will bend left and turn into N Driscoll Blvd. Continue straight onto WA-291 W / W Nine Mile Rd. / W Francis Ave.